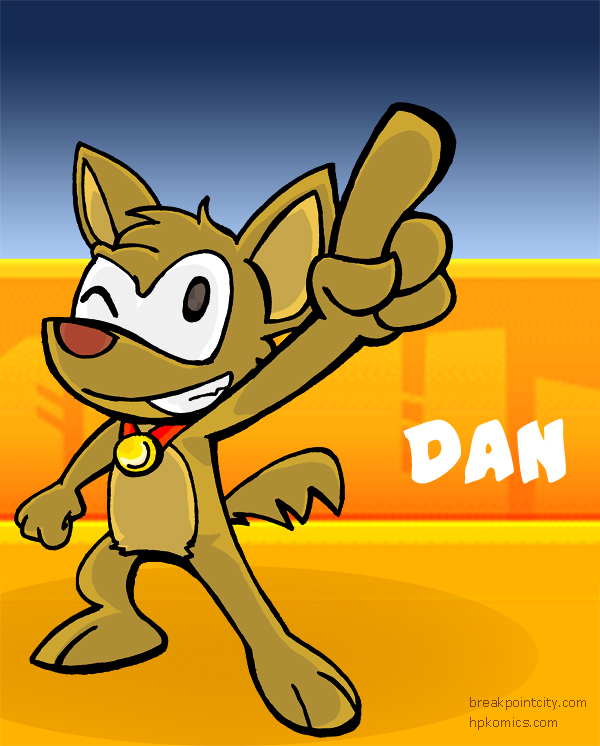 David Davis of Studio Blu drew this awesome picture of Dan! Oof, did not mean to hold onto this pic for so long. I can only assume the best way to make it up to the guy is to plug his site… go there, there’s like three webcomics going, and an army of artists posting stuff!! I think it’s no secret I’m not exactly 100% about this new homepage design. I’m keeping it, no doubt about that… just saying it’s a little too dry. Part of me wants to add in some characters all over the place, but part of me doesn’t want to clutter everything up… the focus should be on the comic. Prolly going to try another animated header logo next week for the holidays. Also, I fixed the search… for some reason, the new version of WordPress natively supports tags, but the built in search box? Nope, doesn’t look for tags. Gotta love plugins that pick up the slack. This unaired 1994 pilot for the show 24 is very amusing, even if you’re not a fan of the show. Especially amusing if you used a computer back in the dark ages. My brother’s going to grad school! Congrats Patrick! Mario Galaxy. One week. One looong week.